ayaq nya yang sejuk, bersih , damai dan aman keadaan sekeliling di kelilingi flora.. terletak di dalam hutan simpan. Nak berkelah , nak tangkap ikan , nak cari udang, nak kutip batu ..err yg ni x boleh sebab kesan kepada sistem sungai...lagi ..... nak skodeng , nak bawa family , kawan2 yang mai rumah tak tau nak layan cam ne.. bawa mai mandi di sedim. The frothy fast flowing rapids at Sedim River Recreation Park near Karangan, 30km from Kulim, is a great eco-tourism draw for stressed-out minds and tired bodies.Picnicking is a popular family activity here as the recreational park has basic infrastructure and facilities such as chalets, changing rooms, public toilets and food stalls. 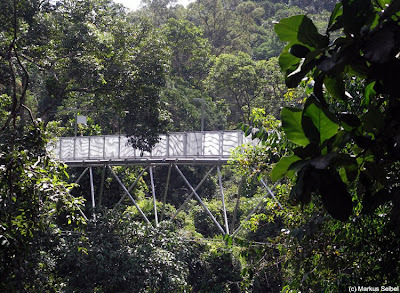 Adventerous visitors can test their endurance by taking on the rapids with rafting, kayaking or canoeing while the less daring can opt for soft adventure activities like bird watching.Strolling along the world's longest 925m long “Tree Top Walk” which is further into the park's forest.The canopy walk promises visitors a breathtaking aerial view of the rapids, some 50m below. 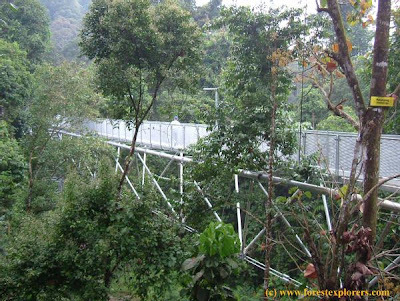 During the walk amid the tree tops, lucky visitors may get to see various species of colourful small birds while enjoying the sounds of gushing rapids and jungle creatures. 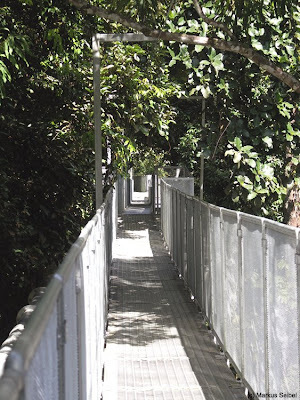 Other activities at the park include jungle trekking as there are a few jungle trails suitable for trekking.These trails lead to nearby peaks such as Gunung Inas, Gunung Bintang Utara, Gunung Bintang and Banjaran Bintang. 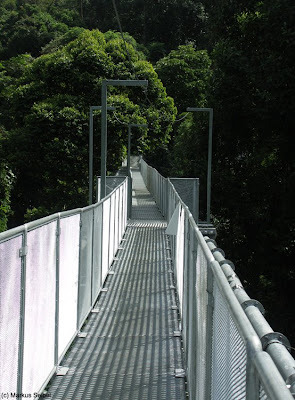 Once you arrived at kg sedim it's easy to find this tree top walk because it's located at end of the road. Admission is free of charge for children below 7 years old. For a large group i could help get discount for you. **Special price for school & college groups. Bring a change of clothes. A warm-up jacket is also a good idea. Also Towel, Shoes, Slippers Sunblock, Insect repellent, Personal toiletries, and Waterproof camera. Wear well-fitting shoes or diving booties. Jewellery which cannot be secured firmly should not be worn while rafting. Those wearing glasses are reminded to use an elastic sports holder to anchor their spectacles. Contact lens users are advised to wear spectacles instead, in order to cut down the risk of their lenses getting contaminated by river water. This is a popular spot for white water rafting in Kulim. Consider to be equivalent to Kuala Selangor's white water. 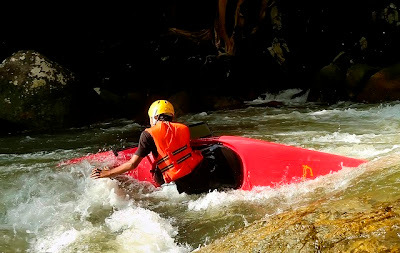 Sungai Sedim has a 15 km stretch that has a fast flowing waters and rapids which are excellent for white water sports activities. Kayaking, camping and just relax to absorb the beauty of its flora and fauna is recommended but visitors are cautioned against swimming because of the strong water current. A wide variety of flora and fauna of lowland dipterocarp forest such as meranti seraya meranti tembaga, meranti melantai and non-dipterocarp species such as kulim, terap keledang and bintangor are found here. The Sedim River has 24 challenging rapids along the river namely the Salak Drop, Triple Rapid, Kasai Drop, Wall Drop, Lower Head Dam, Kawah Rapid, Jelutong Rapid, Rodeo Rapid, Slip Lip Rapid and Cyclone Hole. 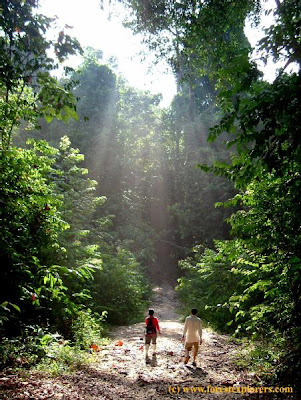 Sungai Sedim is a recreational forest about 30 km northeast of Kulim. The area is being developed into an extreme sports recreational centre with sporting activities such as whitewater rafting, kayaking, mountain bike, camping and tubing. 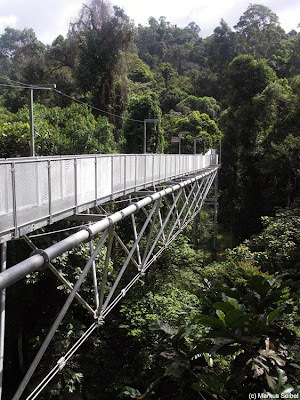 Nature lovers and photography enthusiasts to Sungai Sedim will delight in the flora of the rainforest. 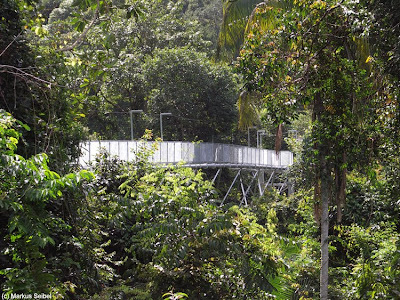 A canopy walk has recently been constructed to offer visitors the opportunity to get closer to the trees. Today I will take you on a walking exploration to simply appreciate the beauty of this place. If you have not been to Sungai Sedim, it isn't very easy to locate. You need some patience to negotiate through long country paths, through rubber and fruit plantations before arriving there.For people who come to seek the solitude and be close to nature, Sungai Sedim is a good place to sit and simply enjoy the cold running water over your feet. I hope that you will also have a chance to visit my lovely Sungai Sedim one day. Happy exploring! Sunlight penetrating the forest canopy at Sungai Sedim. Hi-Tech Park > Karangan > Sedim. to Karangan/Sedim (Please look up for Hutan Lipur Sungai Sedim signboard).